Vertigo's 'Hex Wives' Writer Ben Blacker: The Horror News Network Interview - Horror News Network - The Horror News You Need! For many horror comic fans that came of age in the late 1980s and continued to read and collect comic books into the 90s, Vertigo was their publisher of choice. With titles such as Alan Moore’s Swamp Thing, Neil Gaiman’s Sandman, and Garth Ennis’ Hellblazer, Vertigo was the place to go for mature, literary horror comics. This past year, Vertigo has started to go back to their roots with a number of horror and supernatural titles, such as Ben Blacker, Mirka Andolfo, and Marissa Louise’s Hex Wives. Writer Ben Blacker was able to pull himself away from his cauldron to engage in a lengthy interview about the new series and the ever topical subject of witches. Horror News Network: Where did the idea for Hex Wives come from? Ben Blacker: Hex Wives is the confluence of two ideas I’d been tinkering with in the back of my brain for years, while my writing partner and I were working on a few other projects. Maybe five years ago, I caught an episode of Bewitched on TV. I loved that series when I was a kid; when I’d see it in syndication when I stayed home sick from school. It was a typical episode—Samantha worries about getting dinner on the table for her husband who is bringing his boss home from work. Samantha’s mother, Endora, swings by to tell Samantha that she’s married below her. But this was the first time it struck me that Endora was right! Samantha is this super powerful witch who is “not allowed” by her husband to practice magic! That’s bonkers. Darren didn’t want his wife to be her complete self. So, this was something chugging along in the back of my head. Meanwhile, I was having more frequent and honest conversations with my wife and my women friends about the way they were really treated at work, in relationships, etc. There were a lot more insidious and ingrained attempts to control women than I had realized. Ways of subjugating or minimizing women and their accomplishments seemed inherent to our patriarchal society. It really came to a head leading up to the 2016 election when I saw both how people talked about Hillary Clinton and how others talked about the way Clinton was talked about. Never has someone so qualified run for this position and never has someone so unqualified won it. At its base, this came down to a question of the way women are considered and treated. I learned so much about writing TV from Buffy the Vampire Slayer. One of the lessons from Buffy is about having a central metaphor. When I put these ideas together—an exploration of witch tropes and a desire to write about gender politics—Hex Wives really took shape. HNN: Your story displays witches across time and of course, starts with Salem. Why is this historical setting so crucial to the opening of your tale? Blacker: Hex Wives is, at heart, a love story between Isadora and Nadiya, two (basically) immortal witches. (They can die, but they get reborn as themselves). So, I wanted to give some scope to what I thought of as an epic romance. I wanted to give the impression that these two women were destined to be with each other. That, time and again, they’d find each other. That way, when the bad guys have their way and brainwash all of the witches, and Izzy and Nadiya know nothing of who they are or their past selves, it was really emotionally wrenching. 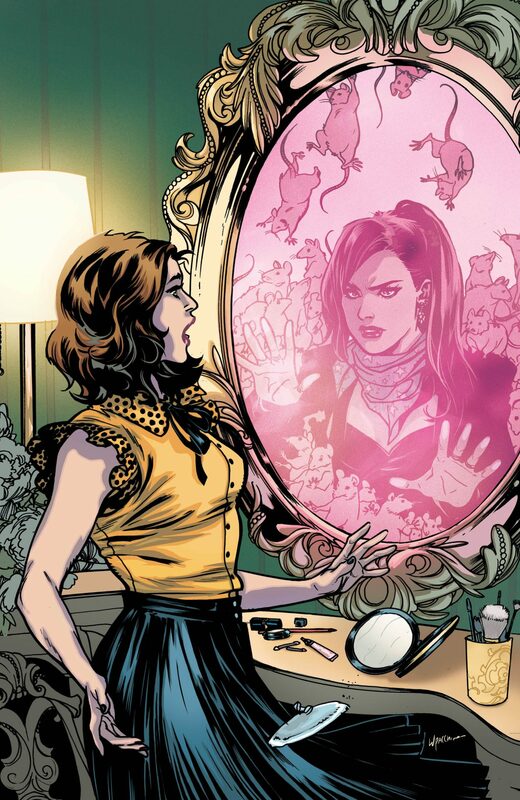 HNN: There are two nine panel scenes in the first two issues where Isadora is getting dressed in front of a mirror. What is the significance of the mirror and her process in relation to your story? 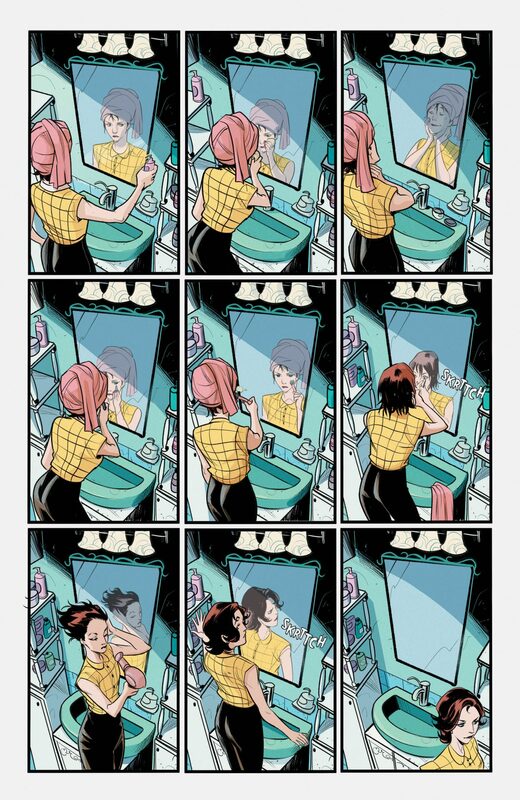 Blacker: That first nine-panel grid of Izzy in front of the mirror, getting ready for her day, was the very first image I thought of for this book, about four years ago, and it’s the one from which everything else sprung. There was something about seeing this woman in a private, intimate moment and knowing that she was doing this for someone else (her husband). 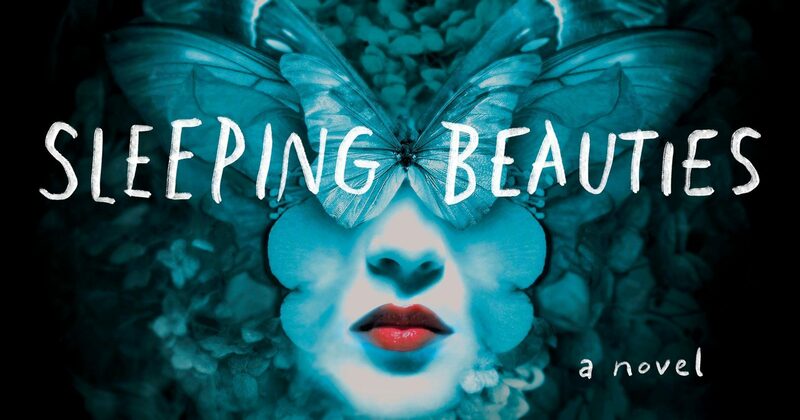 For this character, putting on make-up, doing her hair, making herself “beautiful,” is all for him. I didn’t know why she was doing it, and it occurred to me that maybe she didn’t either. So, that kind of became the basis of the book. A suburban housewife who doesn’t know herself, doesn’t question her reality, who possesses this secret, even from herself. I knew I would repeat that motif throughout the first arc and beyond. Mirrors are, of course, a loaded metaphor. Do you remember the ad campaign for Poltergeist II? Probably you don’t, because who would? But basically, it had a narrator saying “Some people are afraid of heights. Other people have a thing about mirrors…” and etc. I was a kid when that came out, and I remember asking my mom why people would be afraid of mirrors. She responded, in THE MOST TERRIFYING POSSIBLE RESPONSE, that people are afraid they’d look into the mirror and see someone who wasn’t them looking back. This fucked me up to this day! (Emanuela Lupacchino did a terrific take on this idea for the cover of Hex Wives #2). So, without unpacking the entire metaphor of mirrors, I like how they function as an object of horror, a literalization of “knowing one’s self,” and as a tie to witch tropes (“Mirror, mirror on the wall,” and all of that). It was fun taking apart and re-assembling so many witch tropes—broomsticks are another one we tackle—in ways I haven’t necessarily seen in witch media. HNN: How does Mirka Andolfo’s art help establish the tone of Hex Wives? Blacker: Mirka and colorist Marissa Louise make this book what it is. Mirka was the only choice for artist. We had a number conversations at the beginning of the process about designing the witches. It was important to us that they be very real women, that they have different silhouettes and shapes and faces. And Mirka is an incredible clothing designer too. We knew we wanted the outfits of the women to be practical—we really want people to cos-play as our coven! And Mirka designed all of the costumes to not only be redolent of the pop culture witches on which the characters are based, but to create them as if made out of objects the women would readily have. So Izzy’s “cape” is a torn up men’s sportscoat, because in Desert Canyon, she’s kept in dresses and more “classically” sixties women’s attire. We also had an interesting thing happen when Mirka was designing Desert Canyon, the suburban cul de sac where the women live. Because Mirka is Italian, she didn’t really have a good handle on what the 1950s/Mad Men/Bewtiched American suburb I was writing looked like. Her initial sketches had a very European design to the suburbs—narrow houses, small lawns, lots of brick. So, my editor Molly Mahan and I sent over a bunch of reference materials, mostly from TV of the time, but Mad Men and shows that take place in the early sixties were even more helpful, and Mirka translated that material to make it her own. That process of translation gave the whole look of the cul de sac an uncanny, uneasy feeling. The vibe that while everything looked normal, something was a little bit off. It’s exactly what we were going for and not something I think I could have gotten from any other artist. And I cannot say enough good things about Marissa Louise. She’s elevating every page but, more importantly, doing so much to sell both the tone and emotion of every scene. Someone remarked to me recently that they found so much of the first issue to have a sadness about it. I totally attribute that to Marissa. Looking at issue #2, the first few pages of Izzy diving into her pool with her “husband” and having what is basically a happy morning is undermined by the shadows, light, and color Marissa has used—a blue and green palette that gives the suburban scenes a real feeling of melancholy. HNN: What were your first experience or memories concerning witches in pop culture, literature, or history? Is the evil or wyrd woman stereotype still prevalent today? Blacker: My first pop culture witch was probably The Wicked Witch of the West, whom I totally loved as a kid. I remember being fascinated by Margaret Hamilton and trying to find out as much about her as I could, which wasn’t easy before the internet. I thought it was both so cool and so sad that she was probably a great actress but was really only known for this one role where she was covered in green make-up. But she’s so dynamic, so scary, so charismatic. And my favorite witch movie is only partially a witch movie, but it’s also one of my favorite horror movies and maybe even one of my favorite movies, period: Rosemary’s Baby. It heavily influenced Hex Wives. The whole movie has this great feeling of unease, that everything looks normal but really isn’t. (In issue #2 you see a direct homage to Rosemary’s Baby in a piece of furniture!). And, as I said, I’ve taught The Crucible, and I taught Macbeth, so I read those plays a ton of times. There’s definitely shades of The Weird Sisters in Hex Wives. You’ll see them soon! 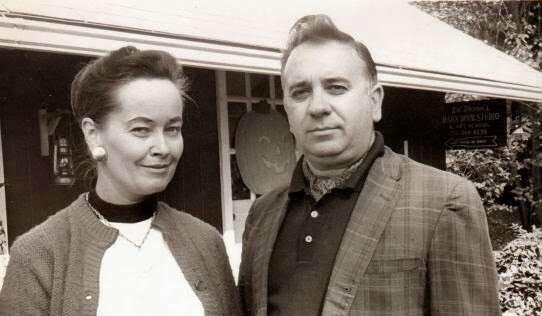 But, honestly, the most inspiring and useful input for Hex Wives came from conversations I had with women (and a few men) who played or write pop culture witches. I got both factual and emotional material to work with every time I spoke with these writers and actors and a couple of practicing witches as well. For my podcast, The Writers Panel, I did 10-ish minute phone calls with everyone from Buffy‘s Amber Benson to Winnie Holzman (who not only created My So-Called Life but wrote the book for Wicked! ), to Madeline Miller, who wrote a terrific novel called Circe which tells The Odyssey from the witch’s point of view. I also did a couple of panels at cons, SDCC and NYCC, both of which had writers (like the creators of the new Charmed and the old Sabrina; Tomi Adeyemi who wrote the excellent Children of Blood and Stone), actors (Supernatural‘s Ruth Connell), illustrators (Scary Godmother creator Jill Thompson), and actual practicing witches (Juliana Crouch and actor Valorie Curry, who was also in the latest Blair Witch). All of these are available on the Writers Panel podcast feed. And everything from them really created the ongoing fabric of Hex Wives. The most important aspect of those conversations that kept coming up was the idea of witches as horror characters. Unlike, say, Frankenstein or Dracula, witches have no literary forebears. There’s no basis text for witches. 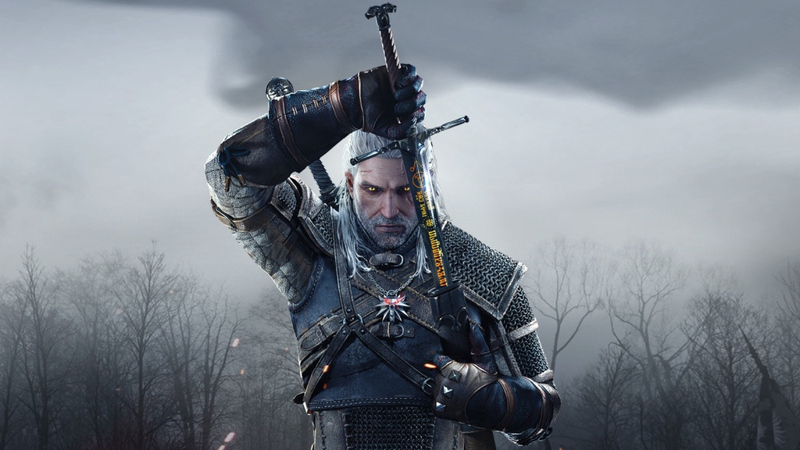 Witch tropes as we know them come from history (and mythology). And it’s meaningful that these women were turned into monsters, by calling them witches, by giving them outsider status, by powerful men. Obviously, that has enormous resonance today. I’m thrilled that so many women are taking back the word “witch.” But, as I love horror, I don’t want to lose the dark connotations of witches. I think they can exist together. Women possessing dark power doesn’t have to be horrific. HNN: The husbands in Hex Wives seem to be clueless about how to connect with and respect their wives (saying nothing about the demonic plotting, of course). What are they missing in these situations? Blacker: Well, the “husbands” in Hex Wives aren’t really husbands at all. They don’t care about connecting with or respecting their wives. In fact, most of them don’t even see their “wives” as human. The husbands are playing a role. That said, putting them in the role of husbands allows me to explore one of the facets of gender dynamics I’m really interested in exploring in this book. That is, the small, insidious, often subconscious ways in which men try to control, minimize, and undermine women. There’s a part in issue #2 in which some of the women laugh about how their husbands “keep them on their toes.” Obviously, the men—the Architects, as they’re called—are doing this in order to keep the women from looking too deeply at themselves or their situation. But it’s also a frequent way in which men control women—by being fickle with their emotions and giving or withholding affection. It’s insidious, but I don’t think most men do it on purpose (unlike the Architects). I think it’s just another of the many negative conventions we get from a patriarchal society. Blacker: The thing I care about the most these days is Hex Wives. I’m proud of the book, and I love working with this team. We all want to work together on Hex Wives for years. But I’ll plug some podcasts I do, as that’s the only other thing I’m allowed to talk about right now! I’m a real process nerd. I love hearing about how the stuff I love is made. To that end, I’ve done over 400 episodes if The Writers Panel podcast, in which I talk to TV writers about the business and process of writing TV. If there’s a TV show you like, guaranteed I’ve talked to the creator, showrunner, or a writer of the show. They’re great conversations, and I learn something every time. I love DVD commentaries, and I thought it’d be fun to do commentaries for comic books. So, on the Writers Panel feed, I’ve started putting out “Comic Book Commentaries” for every issue of Hex Wives. The first two are up now. I mentioned this to a few other comics writer friends, and it looks like I accidentally started a new podcast. We’ll move it over to its own feed early next year, and you’ll get commentaries on single issues from amazing writers like my Vertigo cohorts Eric Esquivel (Border Town), Zoe Quinn (Goddess Mode), and Bryan Hill (American Carnage), as well as Tini Howard (Image’s Euthanauts), Mark Waid (Doctor Strange), Chelsea Cain (Man-Eaters), and a whole bunch more. I can’t wait to hear these, as they’re all comics I love! Hex Wives #2 is currently available at finer comic book stores everywhere.